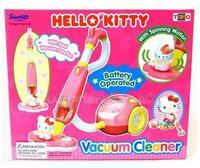 It’s not unusual for Hello Kitty to be plastered on useful products, so this mini vacuum cleaner comes as no surprise. It’s a battery operated device that’s great for sweeping up small spillages, and comes emblazoned with the familiar Sanrio logo. You get two detachable nozzles, a dust bag and case, and apparently it’s a great way to train young kids to be house proud individuals. That, or they’ll come up with interesting things to vacuum.. now where did that diamond ring go?